The major part of this month is highlighted by the bi-annual boiler survey. The upper manhole cover on the Hercules is removed and cleaning is carried out around the steam manifolds. The pipes are cleaned and the furnaces swept. Valves are checked and overhauled. The boiler of the "Heibok4" is as good as ready sofar and requires vacuum cleaning only. Lloyd's is visiting and the boilers are passing the survey successful. A warm survey will follow later. The safety valves are re-assembled and new fire barriers are build. 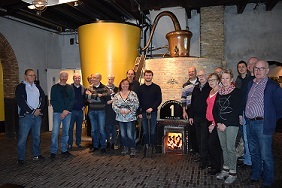 On the last day of the month we are visiting our main sponsor "Nolet Distillery" with a big part of the volunteers. We are getting a view of the inside of this nice family company. After the welcoming reception accompanied with coffee and "mill cake" in windmill "The Nolet", we are getting a guided tour in which a visit to the one and only "Ketel1" ofcourse can not be lacking. Dennis, who was not allowed to join during our first visit in 2008 because he was too young, can throw a scoop on the fire. After the boiler survey the re-assembling can start again. The feed water non-return valve is remounted to the boiler. Sight glasses are equipped with new packing and all pressure gauges may be reconnected. The fire grids are rebuilded. On the "Heibok4" all (manhole)covers are closed and the boiler is pressurized with compressed air. Unfortunately the manhole cover continues leaking so this exercise must be repeated. We are attending the annual meeting of the "Vereniging Stoomvaart" what is taking place in the locomotive shed at the "Stoom Stichting Nederland" in Rotterdam. Incidentally Vincent is passing by with his "Polaris". The deck is cut open whereafter his old fuel tanks are removed. The stern of the "Kleppie" is lifted out of the water because its propeller is entangled with a rope. One is commencing to make a new smoke box for the piling boiler. Once upon a time...there was a wooden steering wheel getting dusty in a basement for decades. Fred was offering to restore it and after lots of hours of work it can be recollected. The hub is adjusted by "Nisse" and a new washer is made. Some of us will miss the old iron steering wheel after more than 30 years. It will be clear that boilers are not growing on trees anymore, but we did find a boiler for the "Goudvisch". With the assistance of "F&L Powerrental" it is transported from the Westland to Schiedam. Time will tell if the boiler is approved again by Lloyd's. It appeared by the way that it came from a similar boat so it would be nice if everything will succeed. The "Vereniging Stoomvaart" celebrates its 40th anniversary and to honour this the members can invite their volunteers to join the paddle steamer "Majesteit". About 170 men/women are travelling from all over the country to Rotterdam for a beautifull evening tour through the ports. It is resulting in an enjoyable evening with thanks to the "Vereninging Stoomvaart" and the Key family. After another non-calculated hours of work finally there can be trialed with the "Argo". "Kleppie" is swinging in action as well when someone with his yaught needs a tow inbound. Our men are willing to help ofcourse and to attend to this. During the pre-season mainly maintenance is done to the fleet. The bulwark, wave breaker, bit heads and anchor davit of the Hercules are taken care of. This means; scouring, chipping and preliminary preservation with Owatrol. The wooden frame of the forward deckhouse is removed, the frames are re-stained where after it is replaced and sealed. The woodworks of the LPG box is upgraded. The bulkheads of the toilet are recoated as well. The gaff of the fore mast is preserved with teak varnish. The engine room is getting a good clean up. Two rivets are renewed of the aft towing arch. Under the wheels of the piling boiler steel plates are welded for reinforcement of the deck. A begin is made for a new smokebox of the piling boiler. At the end of the month a "King's drink" is held on deck of the Heibok4. Just a sociable afternoon with volunteers and partners for a drink and a bite. During these occasions it seems to become tradition to fry a fish on the special stove (vuurduveltje), what is consumed tasteful. Parts of the bulwark are coated black. The navigation light boxes are coated. Under tropical conditions the yellow ornamental line above the sheer stroke and the ship's name letters are applied with a new layer of paint. In the engine room the engine's splash boards and the cabinet doors of the workbench are recoated. The light generator engine is checked. The first part of the pile boiler smokebox is tried to fit. All parts are, as far as possible, riveted the old fashioned way. A damper is made fit for the funnel including a handle to be able to operate it. It needs no explaining that our men are handy with tools and the expression "one good turn deserves another" is applicable at us as well. After Vincent it's the turn to Bas now. With might and main a new part is made in his bulwark and bow where after he can proceed to the yard with confidence. Pressure is building up in the boiler. The first event for the Hercules and Heibok4 is nearing. A warm survey is yet to be conducted so the efforts are increased to complete the funnel of the piling boiler timely. It succeeds and fortunately all is approved by Lloyd's. The VHF's are checked up by VRM Marine and are collected by Richard. We are bunkering coal. It is quite warm and are fortunately with a large team in order to relief eachother regularly. Not all coal fits on board and the remains go on the pontoon. After the boat has been deck washed, the first new name board is attached to the funnel band finally. With thanks to the steady hand of Hans. Perfect, never realigning magnet letters after an enthusiast whistle concert. And then it's there, bound for Terneuzen with captain Hans at the wheel. At Vlaardingen we deviate into the Voorhaven where we disconnect the Heibok4, which is participating the Loggerfestival. Captain Kees takes over the Heibok4 with the Argo and brings her further inbound. Together with Dockyard V among others we are touring passengers in Terneuzen. It is a perfect weekend with lots of joy inside the music tents and also captain Hans is entertaining us with his accordion music. Homebound on Monday afternoon we meet the Heibok4 and Argo again which are awaiting on the river standby already. At the end of the week after regaining energy, with the years also this takes some more time, we add coal to the bunkers from the remains on the pontoon. The gaff is replaced in the mast. The frame of the deck tent is washed and painted. 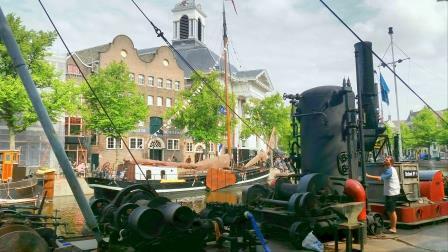 The boiler is fired up in preparation for the voyage to Zierikzee/Veere. Carolien is joining and is interviewing Kees meanwhile for writing a column in the magazine of the Hoogaarzen. 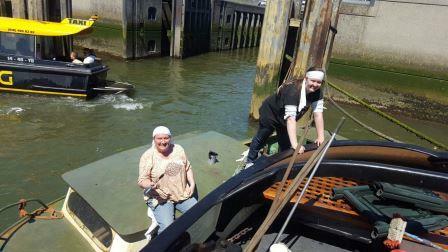 During manoeuvring into the Krammer locks we have to manoeuvre very slowly. There appears to be a crack in the handle of the engine's main steam manoeuvring valve. Fortunately this can be welded the same evening in the workshop of a good acquaintance of Rene. The initial race is running quite wet mainly. The deck tent on boards gives us some shelter at least fortunately. To make matters worse we are entangling something in the propeller after dropping anchor. Rene did sacrifice himself armed with gloves and a saw to solve this problem in the cold and choppy water. 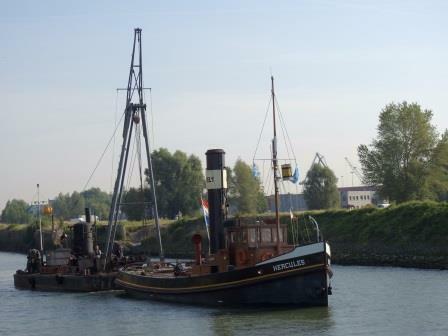 Also the Heibok4 is performing this month during the official opening of the new "Taan bridge" in the Lange Haven. On request of the organization one was given a whistle regularly from our bronze choir. After all those years we actually did not dare to hope for, but we are participating once again with the Vestingdagen in Hellevoetsluis and the Heibok4 and Argo are joining as well. The Hercules is touring, together with the Dockyard V and the Volharding 1, two days up and down with passengers. The Heibok4 is moored alongside where the sightseers can see how the winches are running and the fire pump is demonstrated. Lovely to be surrounded a whole weekend by historical inheritance maintained in good condition by lots of volunteers. (And frankly speaking, if it goes on like now we all can quit because of all regulations and then there's no inheritance anymore to enjoy of). During departure Hellevoetsluis a fore tow was given by the Dockyard V resulting in splendid pictures taken from a following Argo. Talking about history, we are passing the old Botlek bridge for the last time. No events this month so we continue with maintenance of the fleet. On board the Heibok4 the main hoisting winch is chipped completely and painted black, same as the aft winch, the smoke box and funnel. And finally there is some time to work on the "Goudvisch". A piece of bottom shell plate is removed. Rivet stems are cut off the keel. The first part of bad bottom can be removed. A V-shape is hammered into a new steel plate. Pad eyes are welded on this plate whereon this plate can be chain hoisted, where after the plate can be aligned and made fit. This year we are joining the Furieade with the Hercules only. During the opening evening it's dry fortunately and we are enjoying the passing lampion parade and brass bands. Despite the main part of Saturday it's raining cats and dogs we did have sociable visitors. Willem van IJsseldijk is passing by to hear the sound of his steam whistle under steam pressure. Ed is passing by for periodical survey of the fire extinguishers. Sunday morning homebound we are catching a glimpse of the old Botlek bridge being dismantled. On the Goudvisch one is in full swing and the first bottom plate is made fit, spot welded where after completely welded. On both sides coal bunker bulkheads are aligned, spot welded and welded. The frames are welded to the bottom plates. The fire and support tubes are removed from the boiler. The tube plate is brushed and preserved with Owatrol, the stubs from the furnace are grinded smooth. 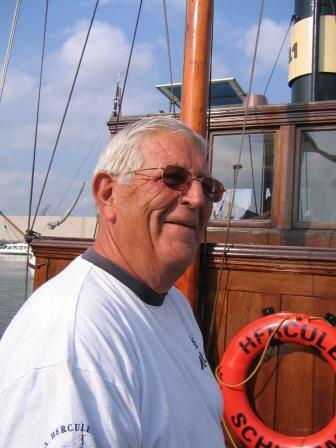 We receive the sad announcement that old volunteer Martin van Holst passed away. On the day of his cremation we are flying the flag at half-mast. On the Goudvisch one is on full "steam". The forward port side coal bunker bulkhead is fully welded. A new forepeak bulkhead is cut in shape, and an elbow with flange and steps are made on its inside. This bulkhead is welded in place and cemented afterwards. In way of the boiler room a new bottom plate is cut wherein a V-shape is hammered. This one is made fit and spot welded where after it is welded completely on the upper part. The frames are being welded. A dent in the side is pushed out with a jack. Everything is prepared for the winter. All vessels and pipelines containing water are drained. On board the Hercules the manhole of the boiler is taken out and the condenser with a lot of tubes is given extra attention. The tarpaulin of the deck tent is replaced by the winter version. On the Heibok4 the brakes of the foreward winch are removed for overhaul and revision. 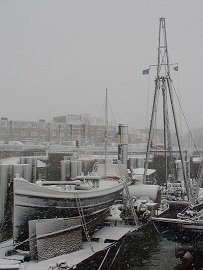 Snow is falling and the projects are suspended temporarily..